Great news for NewToy their latest iPhone game We Rule has now been approved by Apple and is live in the Canadian AppStore. No doubt it will soon be available worldwide very shortly so keep an eye on your App stores! The game is a free download so if you live in Canada check it out right away! Ngmoco have released a video blog where Matt Roberts walks us through a preview of the game. My first impression is that it looks very similar to the Farmville genre – “Social gaming” on Facebook. 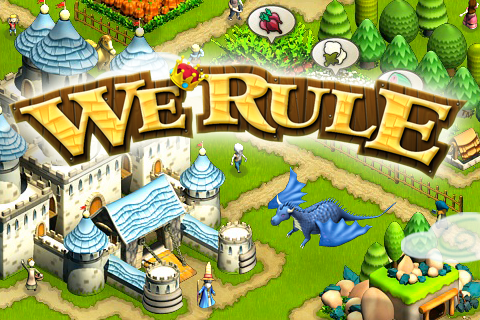 With We Rule you’ll have much greater control than just planting and harvesting crops, theres building management and the ability to visit other kingdoms and trade merchandise. While it should be noted the game does require a persistent (always on) data connection it should be great to play casually when your on the train or bus for instance. Coverage depending of course! You will collect taxes from your citizens and manage a variety of shops and businesses – from bakeries and inns to lumber mills and ore mines. There do not seem to be any screenshots of the game yet, but stick around and we’ll try and dig some out. Meanwhile check out what you can from the the graphic below. Certainly seems to be a big project but no doubt the Bettner brothers at NewToy are up to the task. For more information on the game the press release follows below and a link to the website. ngmoco has a new social game, We Rule, in the works. We’re excited to share it with you. In We Rule, you will govern your very own kingdom. You will act as a city planner and landscaper—customizing your realm with buildings, banners, and botany. You’ll decide what crops to plant and ensure they are harvested on time. You will collect taxes from your citizens and manage a variety of shops and businesses – from bakeries and inns to lumber mills and ore mines. We’re also pleased to announce we’re collaborating with App Store star Newtoy to create this innovative, next-gen social game. Newtoy has a strong development pedigree on a host of platforms – before iPhone and iPod, the team helped create Age of Empires and Halo Wars. More recently they’ve engineered smash mobile hits Words with Friends and Chess with Friends. Soon you’ll have a chance to build a kingdom of your own. We’ll be revealing more about the game soon. And if you’d like access to exclusive info and screens, chat with gamemakers and help us make We Rule better, join the ng:community. Chess With Friends came from that philosophy. The game got good support from Apple, which featured the game prominently on the App Store as Pick of the Week in March. The vote of confidence led to a nice jump in sales. But it still didn’t break the top 100 Apps on the sales ranking list on the App Store, meaning visibility for the game would be low. For iPhone developers, making the top 100 is a crucial requisite for having a successful game. Bettner said he didn’t pack up and go home. There is a life outside of the Top 100, and it involves sustained growth of a game’s sales and good consumer retention, two things possessed by Chess With Friends and its Scrabble-style counterpart, Words With Friends, he said. Combined, Chess and Words, which both have ad-supported free and paid versions, have been downloaded 500 million times so far. They draw 50,000 active users daily, and are tracking 200,000 for September, Bettner said. The ratio of free to paid versions is 5:1. Check out the full article on Gamasutura. As NewToy continue development on new and exciting applications such as the much awaited “World War Robot” with acclaimed artist Ashley Wood.